The Israeli air force carried out, on Saturday at dawn, two air strikes targeting two areas in the Gaza Strip, for the first time since Israel’s war on the coastal region ended three months ago.Media sources said Israel F16 fighter jets fired a missile into an area, where an illegal settlement once stood, east of Khan Younis, in the southern part of the Gaza Strip. The attack led to property damage and power blackout in large areas in the Khan Younis district. It did not lead to injuries, while army helicopters and F16 jets have been flying over the coastal region on a low altitude raising fears of additional bombardment. On Friday afternoon, Israel alleged a homemade shell was fired from Gaza, and landed in an open area, in the Eshkol Regional Council of Settlements in the Western Negev. Erdan also held Hamas responsible for any violations of the ceasefire agreement. 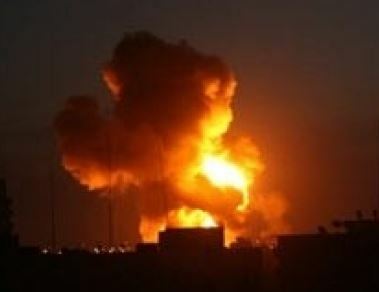 On Friday evening, five young Palestinian men were injured by Israeli army fire east of Jabalia town, in the northern part of the Gaza Strip. The five were moved to the Kamal ‘Adwan Hospital suffering mild-to-moderate injuries. The soldiers opened fire from their military towers, east of the Shuhada Graveyard, in the eastern part of Jabalia. Israel has been frequently violating the ceasefire, by conducting dozens of limited invasions into border areas, and uprooting Palestinian farmlands, in addition to frequent assaults against farmers and workers in border area, and the ongoing assaults against the fishermen in Palestinian waters.